When you are new to the whole new concept of script writing, it can be quite challenging. By seeking help from professionals, attending scriptwriting seminars, and doing your fair share of researching a few scripts from archives, you will eventually get the hang of it and your skills will definitely improve. Writing a script is really quite a tedious task especially if you have dreams of making it big in the business. We want to help you reach that dream or maybe pass your drama class. 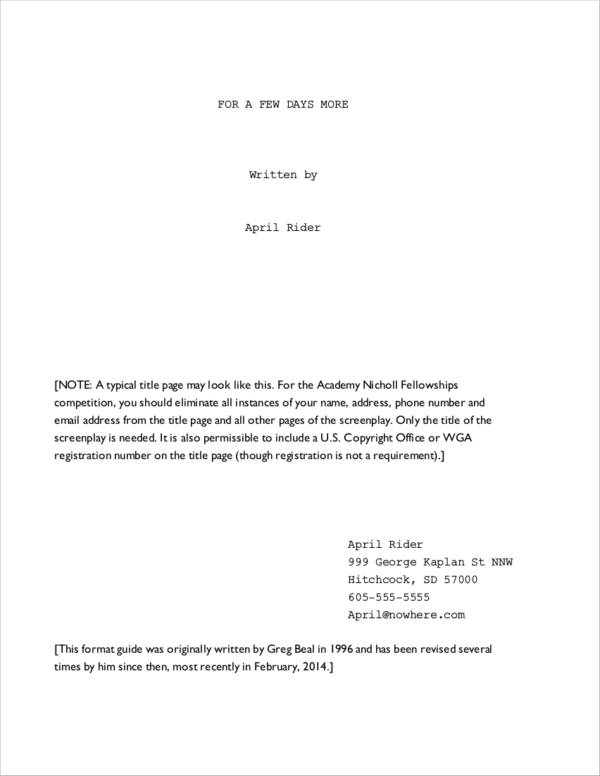 So we are here with a few free writing samples including screenplay samples and scripts for short films. 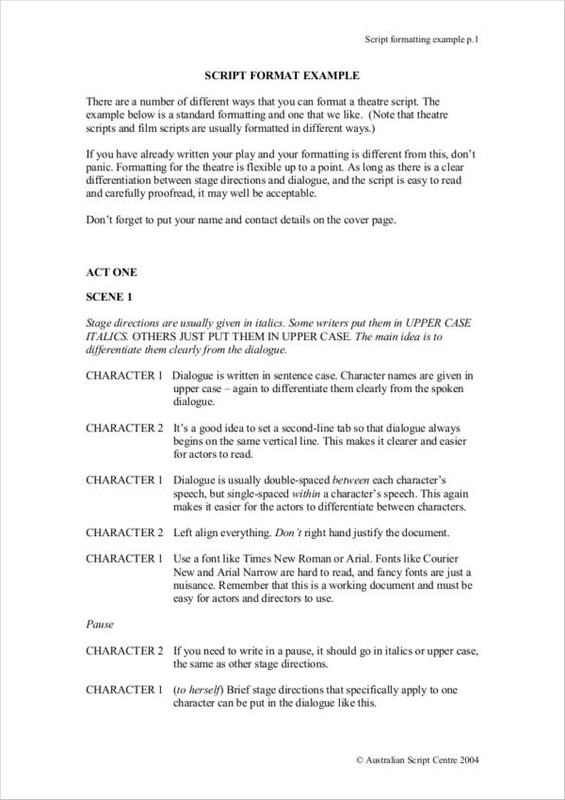 We also have a quick guideline that can help you out with coming up with your script. 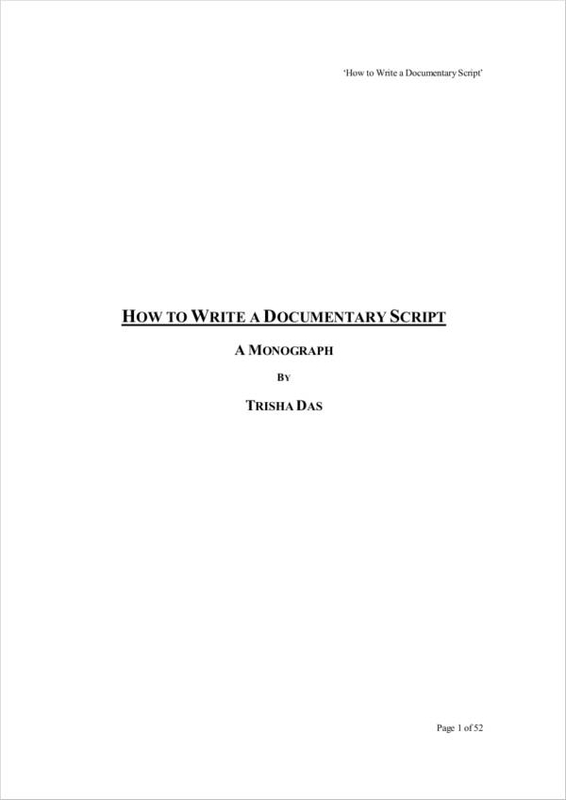 Continue to read this article to help you widen your perspective with regards to writing your very own script. Scripts are a great way of ensuring that shows go as planned and that they start and end well. Whether you are planning to write for purposes of enhancing your scriptwriting skills or writing a script for an upcoming play, we would like to help you out. 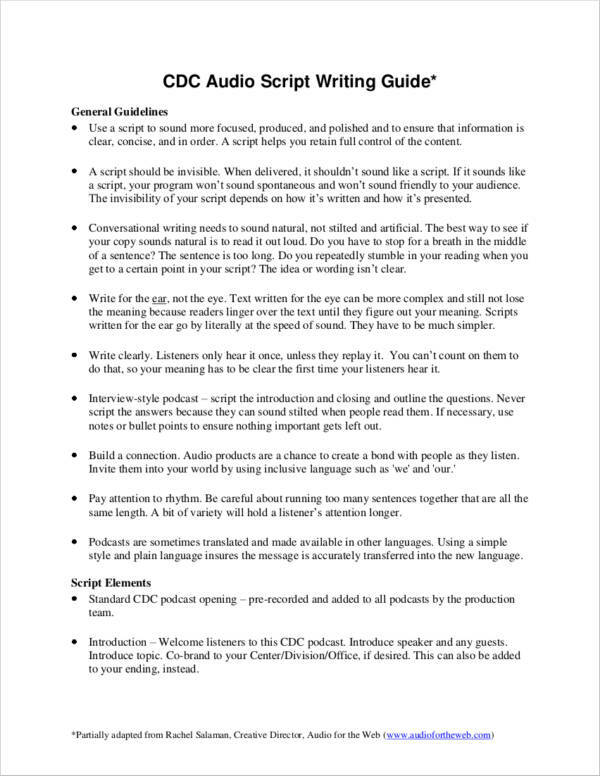 We have a simple general guideline for writing scripts that you can easily follow when you decide to start writing your very own script. Keep reading to find out what the guidelines are. 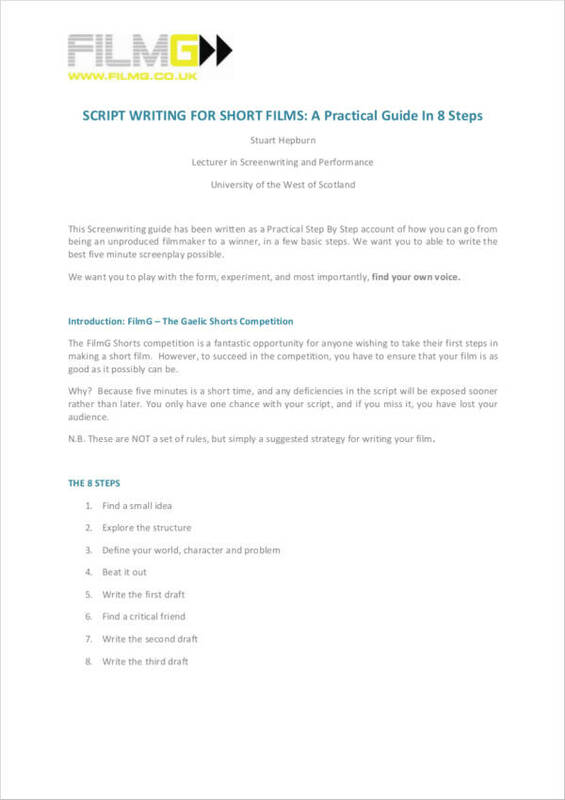 You may also see essay writing samples & templates. 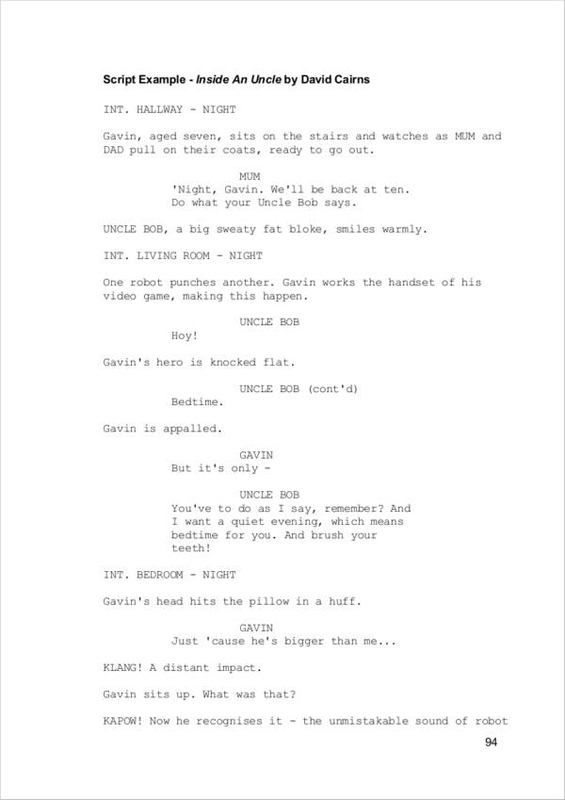 Before we let you in on the juicy parts of writing a script, we should let you in on a few basics about scriptwriting. Here are some of the basics that you need to know. You may also have summary writing samples & templates. your agent’s information, if you have one. Use the correct font and margins. You have to make sure that your font, margins, and page breaks are appropriate for your script. For scripts, using the Courier New font style in 12pt size is pretty standard. It makes your script look a whole lot more professional and easier to read as the spaces in between each letter looks refreshing to the reader’s eyes. 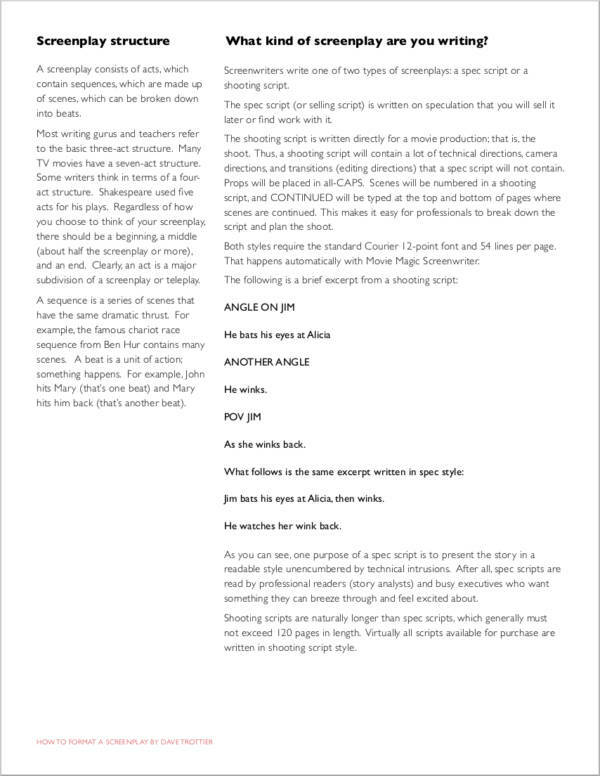 Aside from using the correct font, using the correct indents and page breaks for each part can help the reader determine which ones are the dialogue, which ones are the narrative about a certain scene, as well as the other parts of the script. Good paper formatting is essential to writing scripts. Give a description of the setting and the characters of your script. Give a good description of where scenes are taking place, the specifics of the location, as well as the time of the day the scene is occurring. When writing a character’s name for the dialogues and scenes, make sure to write it in all caps. Instructions can also be placed in between parentheses for differentiation purposes. You may also check out letter writing samples & templates. Make use of the correct formatting for the purpose that your script will be used. 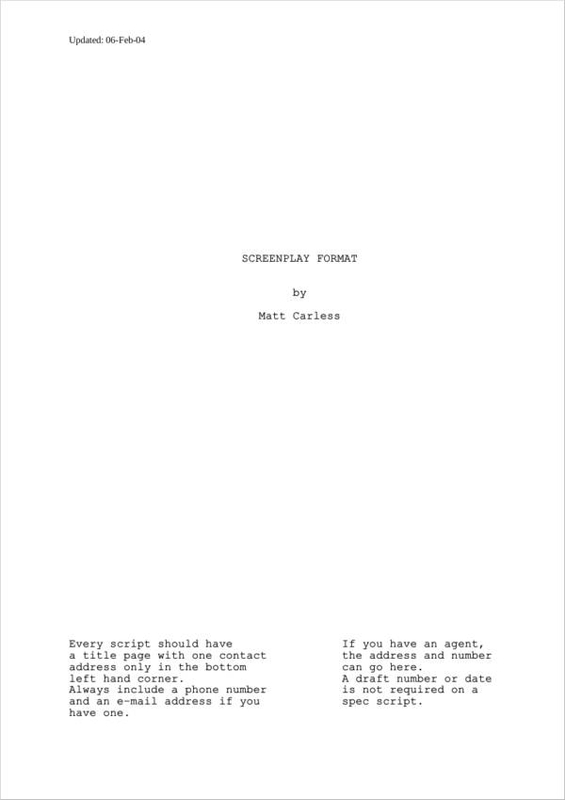 There a few distinct differences between movie scripts and scripts for plays. Take your time with going through a few different types of scripts to have a better outlook on how different types of scripts look like. 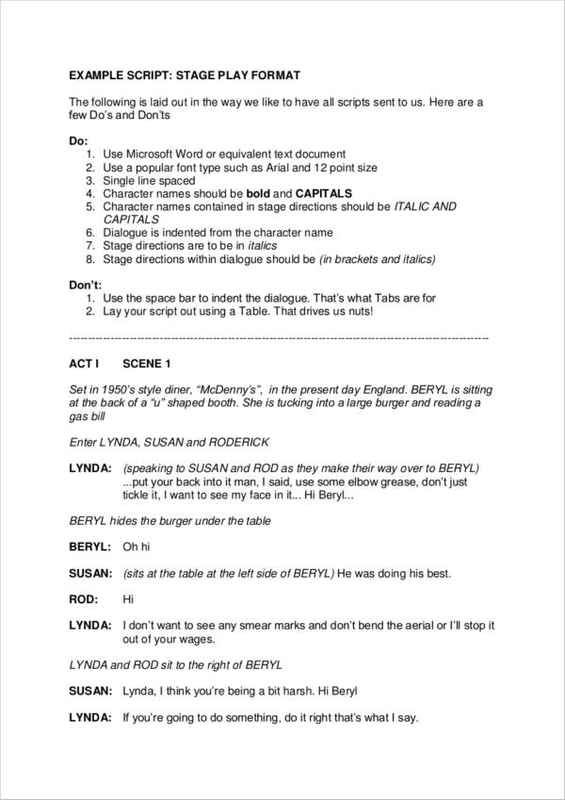 This way, you will know how to properly format your very own script. You may also see memo writing samples & templates. Make it just right per page. A one-minute scene is enough for one page. Make sure that when you are writing, you do not make each page scene too lengthy. You may also like article writing samples & templates. The concept. What is the main idea of your story? What message are you trying to convey? Write it down in a form of a short sentence. This will give the reader a good gist of what you are trying to say. You may also check out business report writing. Outline. Outlines are important for whatever type of writing you are trying to make. This helps to make your writing more organized as you know the main sequence of how your script will go. It also helps you to focus on what you are trying to write and be able to figure out how to go about any loopholes that you might find as you are writing your script. A story outline is a good fit for your scriptwriting process. Go into detail. This is not yet the time for you to pay attention to the style and proper formatting of the story. Just lay down the main idea that you have regarding the main story. This will include the main plot of your story, the characters and their relationship to each other. After writing the main story, you can now make use of a storyboard to help you demonstrate how you imagine each scene would look like. 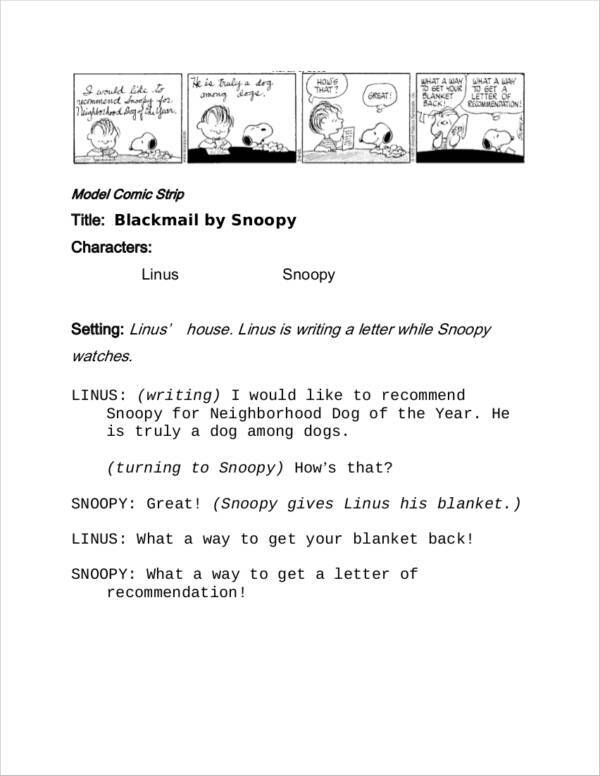 We have a few downloadable script storyboard samples and templates that you can refer to. This will definitely help to make this part easier for you. Trim. Read through your story and check out any part that may seem unnecessary and irrelevant. You want to make sure that you start and end strong with your story. Look at your story in a way that others would read it. If you are having a hard time trimming down your story, you can ask someone else to give his/her insights into your story. You may also see biography writing. Do some research. 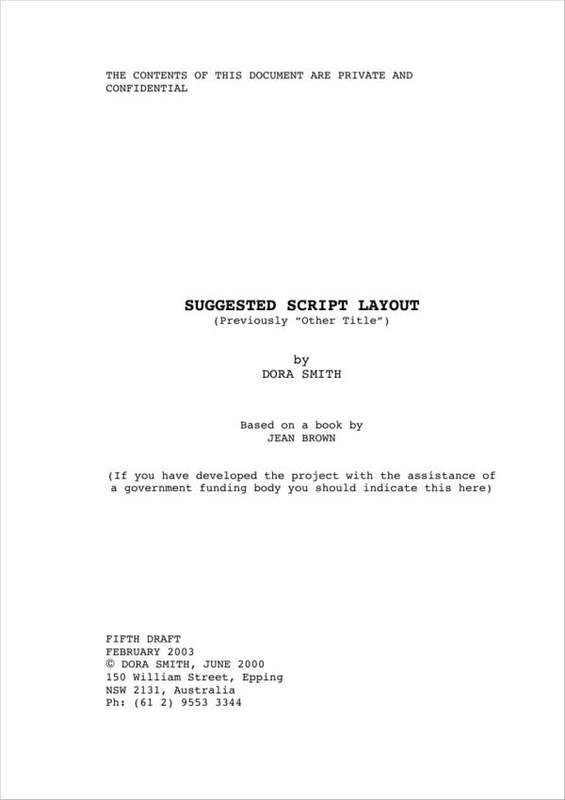 Once you have written everything down and have finished making the first draft of your script, you want to make sure that you do some simple research. Watch some movies, TV shows, and plays that you deem comparable to your script. Compare what you have researched with what you have worked on. Is it a good match with what you are trying to achieve? Simplify. The simpler the language, the better as it will be easily understood by the general audience. No need for fancy words in your dialogues. Simple language, if written properly, can help to keep your audience engaged. You may also like speech writing samples & templates. Review the format. Again, you want to ensure that you are following the correct format. Make sure to emphasize scenes by making use of headings. 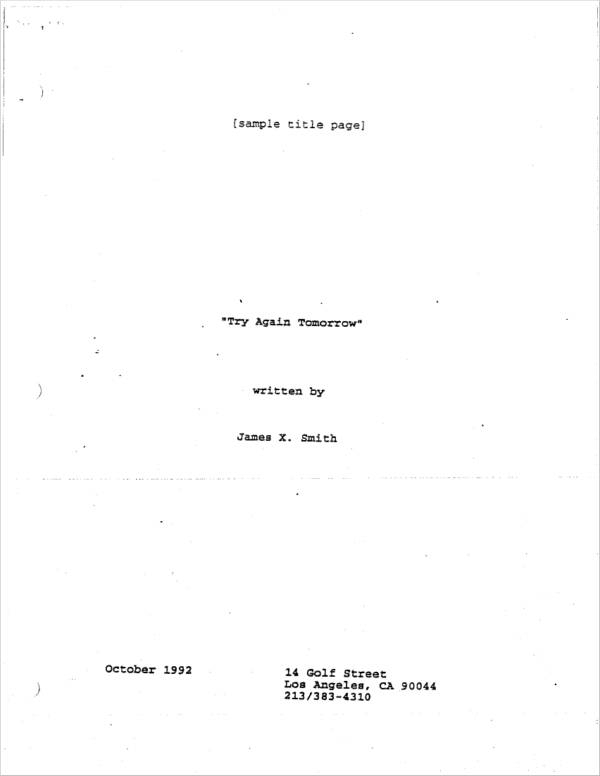 If your script is not in the correct format, your script will highly likely be thrown in the garbage. Be consistent. Keep your writing style consistent all throughout the script. Avoid mixing styles unless you have a certain goal with doing so. You may also see sample letter writings. Include specifics. Do not forget the setting and the character’s actions for specific scenes. This will give the reader a good picture of what you are trying to convey. You may also check out job application writing. Describe actions briefly. Give the audience a good feel of what is happening to specific scenes by describing what happens. Work on the dialogues. The characters’ dialogues are very important. You want to make it seem natural and not awkward. Each character has a different personality, so you can get some ideas on how you can develop a character’s dialogue by digging deep into the character’s persona. You may also like technical writing samples and templates. Make sure that your script ends up being polished. Work on the grammar and misspellings that you may have in your script. Ask for opinions from people. Ask them for constructive criticism to help you improve your script whether it be a scene or character. You may also see resume writing samples & templates. Revising your work several times can get frustrating, but revisions help to make your script more interesting. Interested in writing a book? We have a few book writing samples that can help you out. 1. Be sure you know what type of genre you are writing. This will help you stick to what you need to write. 2. Make your script sounds more natural instead of scripted. This way, readers are more likely to relate to what you have to say. You may also see proposal writing samples & templates. 3. Get an electronic proof-of-creation to ensure that what you have worked on is 100% your idea. 4. You can attend a class dedicated to scriptwriting. This will help to enhance your skill for writing. 5. Do not be afraid to experiment. You can add in some plot twists. 6. Do not get frustrated. Scriptwriting will take up some time especially with all revisions and editing. So be sure that you remain patient. You may also like thesis writing samples & templates. 7. Do not get disappointed if you get rejected by production companies. Take it as a means of wanting to improve your writing style. 8. Try to get an agent. He/she will be able to give you good advice on how you can market your script properly. We hope we have helped you out a lot. It is now time for you to start writing that script. Who knows? You might make it on the big screen soon! Good luck!